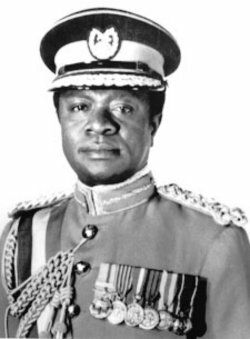 On this date in 1979, the putschist government of Ghana shot former military rulers Frederick William Kwasi Akuffo and Akwasi Amankwaa Afrifa along with four others at the Teshie Military Range for corruption. Twenty-two years before, Ghana had become the first black sub-Saharan former colony to gain independence, but after a 1966 coup it had staggered through political and economic chaos. Six different men had been head of state in that span, three of them deposed by coups. By 1979, General Fred Akuffo‘s government was the target of explosive anger. Enter Flight Lieutenant Jerry Rawlings, who had actually failed in a coup attempt in May and was in line for execution himself before his mates toppled the government on June 4. Seeking to stabilize the situation — and, Rawlings himself has said, riding the tiger of popular fury — the new government served up a few high-profile morsels on charges of pilfering the treasury in order to forestall a general slaughter of senior officers by the armed forces’ lower ranks. There was no alternative. We had to contain it within the military so it didn’t spill into the civil front — if it had it would have been terrible. We had no choice but to sacrifice the most senior ones — the commanders. I feel greatly disturbed about the future after the government … In order to discourage the military from staging coups in the future, how about if they line all of us up and shot us one by one? I do not certainly want to be arrested, given some sort of trial and shot. All these shootings had an unseemly character of haste and summary justice; charges against the four senior ministers* shot along with the former rulers have struck an especially sour note. Rawlings has claimed that he only wanted the two former heads of state shot and tried unsuccessfully to stop the other four executions. I attempted to prevent it and sent an officer but the firing squad shot the officers before their commander could give the order … you must understand our country was in a state of rage then, not different from what Russia was when it had its revolution. I was a partial hostage to that situation. I had no force. The authority that I enjoyed was my moral authority with the people. Their action (the execution of the senior officers by the boys) was to curtail the anger of the nation. He would run Ghana for the next two decades, the last eight years after winning elections. Rawlings’ legacy is much up for debate, but to many he cuts the figure of a benevolent dictator (how many former strongmen have fan pages?) whose human rights abuses were mild in the scheme of things and helped usher in a relatively prosperous and democratic Ghana that stands a very far cry from the country he took over in 1979. There were some of them who probably deserved it. Pardon me for putting it that way. There were some of them who did not — very brilliant, beautiful officers. But we had no choice but to make that sacrifice. The bodies of all the officers executed in June of 1979 were exhumed for “fitting burial” under Rawlings’ successor in 2001. * One of the aides held the Ghanaian high jump record at the time of his death, a mark not surpassed until 1996.